Adding cones or chairs into drills is a great way to simulate defenders, taking skill development to another level. Although there are many areas in which coaches need to focus on at any given time, it is essential to include skill development as one of the primary focuses throughout the season and off season. Sure – building team defense, perfecting offense, implementing game plans, creating scouting reports, and many other things need and deserve a coach’s attention throughout the course of a season, often leaving little time for the optimal amount of skill development in daily practices and training sessions. But this hich is to the detriment of players. This is what makes makes dynamic drills so important and valuable to coaches and trainers. 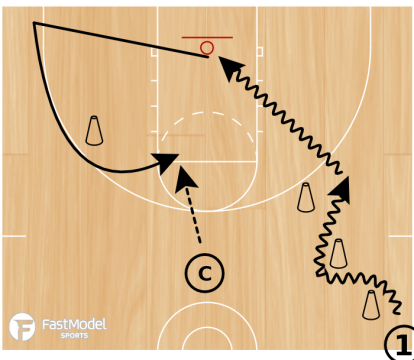 Dynamic drills are drills that work on multiple skills in the same drill. Below are a 10 of my favorite dynamic drills involving cones or chairs that our program runs regularly. Add these into your off season player development program, pre-practice routine or as common practice drills during the season. Click on a diagram to add the drill to your FastDraw library. • 1 utilizes the cones to complete various moves. • 1 dribbles around each cone. 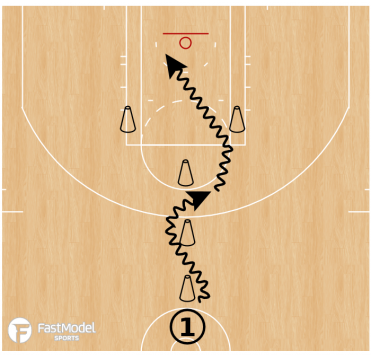 • Once they clear each cone, the player works on a designated finish at the basket. • The finish after clearing each cone can be the same for all three or varied from cone to cone. • The corner line is the passing line and top of the key line is the cutting line. • The ball is passed from the corner to the top of the key. • The player in the corner uses the cone as a screen and completes a designated cut. • The cutter receives a pass and works on a designated finish. • Each player in line has two basketballs. • 1 dribbles both basketballs simultaneously. • 1, while continuing to dribble, passes the ball from his right hand to the coach. 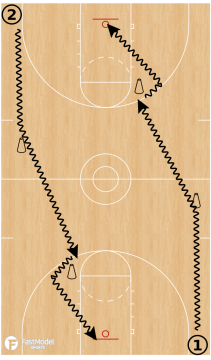 • 1 then drives to the cone with their left hand, makes a change of direction move, and finishes at the basket. • 1 then completes a curl cut off of the second cone and receives a pass from the coach for a shot. Regular layup, two-foot power layup, shot fake finish, inside hand finish, floater, step back move, step back counter, etc. Jump shot, pull-up jump shot, floater, up and under, step back move, step back counter, rip and drive to the rim (either side), etc. • 1 curls around all three cones. • Each time the coach passes #1 the ball. • Each time 1 receives a pass they take a designated shot (i.e. layup, jump shot, floater, etc.). • The next player in line starts the drill once 1 has cleared all three cones. • Players complete a right-to-left cross over move at first cone. • They then complete a left-to-right cross over move at second cone. • After they clear the second cone, they take a shot or work on a designated finishing move. 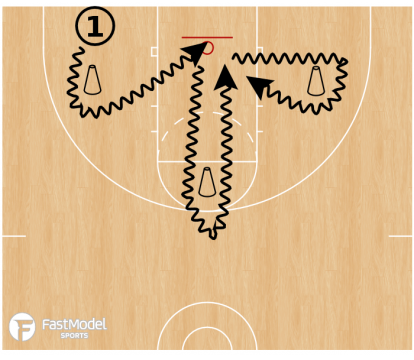 • Players are completing the drill on both ends of the court at the same time going opposite directions. As the drill progresses, have players use different change of direction moves, combo moves, and finishes. • 1 dribbles around the cones, using a change of direction dribble at each one. 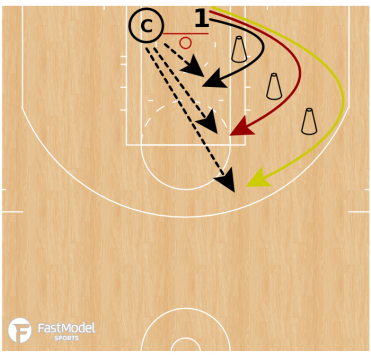 • At the last cone, 1 makes another change of direction move and finishes on the opposite side of the basket. 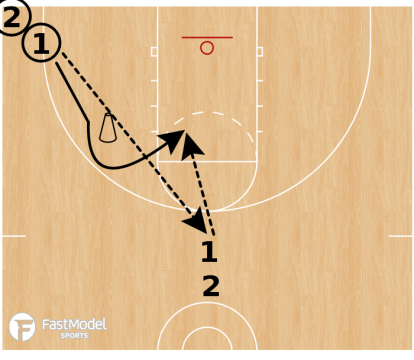 • 1 attacks the first cone with dribble. • Once they reach the cone, they use their retreat or pull back dribble to gain separation and release pressure. • Repeat the same steps at each cone. 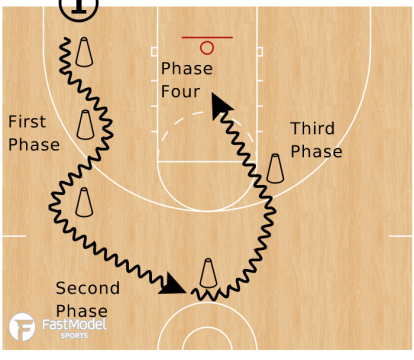 • Once they use their retreat dribble after the third cone, they complete a designated finishing move at the basket. • 1 dribbles to the first cone and then performs a retreat dribble. 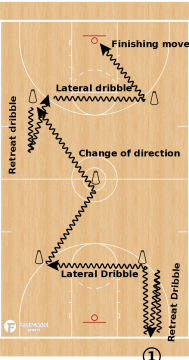 • After the retreat dribble, 1 dribbles back towards the same cone. • 1 then completes a lateral dribble to the next cone. • Once they reach the second cone, they drive hard to the middle cone with their right hand and complete a change of direction move. 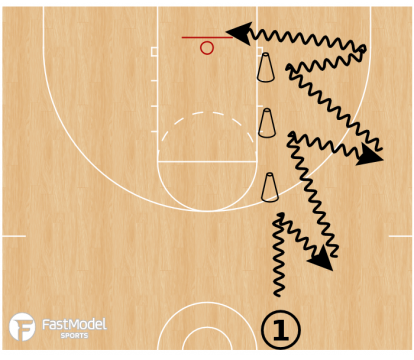 • At the fourth cone, 1 completes another retreat dribble and attacks the same cone again. • They then complete a lateral dribble from the fourth cone to the fifth cone. 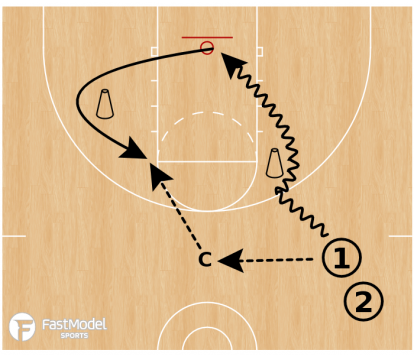 • 1 makes a change of direction move at the fifth cone and completes a designated finish around the basket. • 1 dribbles through the cones using various change of direction moves and attacks the basket. • After taking a shot, the player widens out to the corner and cuts hard off the cone simulating a cut off of a screen. • Coach passes the player the ball for a shot. Start running these dynamic drills with your players TODAY and see how fast their skills progress and develop! Let us know your favorite one by tweeting it out. Matt Monroe is currently the Head Boys' Basketball Coach at Saint Ignatius College Prep in Chicago, IL.